1 of 1 Combine cranberries, sugar and water in small saucepan. Bring to a boil. Lower heat to medium; cook, stirring occasionally, 10 minutes or until berries are popped and mixture is thickened. Press through sieve into medium-size bowl to remove seeds. Set aside to cool. You should have about 2/3 cup cranberry swirl. 1 of 4 Heat oven to 350 degrees F. Grease and flour 12-cup bundt pan. Whisk together the 3 cups flour, the baking powder and salt in medium-size bowl. Beat together butter and sugar in large bowl until light colored and smooth, about 2 minutes. Add eggs, one at a time, along with extract, beating well after each egg. On low speed, beat in flour mixture in 3 additions, alternating with milk, beginning and ending with flour. 2 of 4 Fold together 2-1/2 cups cake batter with cranberry swirl until no white streaks remain. Fold in the remaining 1/4 cup flour. 3 of 4 Dollop plain batter into prepared pan, alternating with cranberry batter; do not let cranberry batter touch side of pan. Swirl batters in pan with sharp knife to marbleize. Tap pan gently on counter to release any air bubbles. 4 of 4 Bake cake in 350 degrees F oven for 1 hour or until toothpick inserted in center of cake comes out clean. Cool cake in pan on wire rack for 15 minutes. Run thin, long knife around center tube. Invert pan onto platter; tap gently to release; remove pan. Let cool completely. 1 of 1 Meanwhile, beat together confectioners sugar, water and almond extract in medium-size bowl until good glazing consistency. Keep covered with plastic wrap until using. 1 of 2 Heat oven to 350 degrees F. Whisk together flour, confectioners sugar and ground almonds in medium-size bowl. Drizzle with melted butter; toss together with fork. Using hands, crumble mixture into pea-size pieces. Spread onto baking sheet. Bake in 350 degrees F oven for 12 to 14 minutes or until golden and dry to the touch. Let cool completely. 2 of 2 Place cake on rack over rimmed baking sheet. Working in batches, spread small amount of glaze onto cake. Press crumbs into glaze. 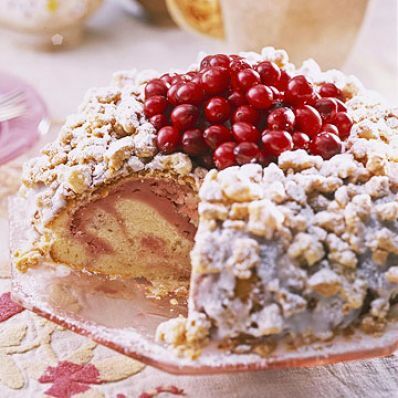 Continue around cake and in center, until cake is covered with glaze and crumbs. Dust with sugar. Fill center with cranberries, if desired.